"This is by far the best apple pie I've ever had, and anyone who likes apple pie who has tried it agrees, this is a wonderful variation of an all-American favorite. Enjoy with a scoop of vanilla ice cream." 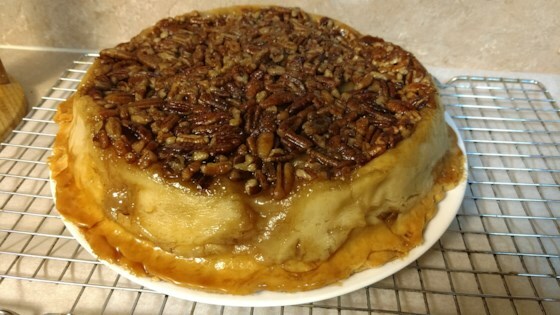 In a 9 inch deep-dish pie pan, combine pecans, brown sugar and margarine; spread into a single layer. Roll out dough, and place bottom crust over pecan mixture. In a large bowl, combine apples, sugar, flour, cinnamon and nutmeg. Pour into crust in pan. Top with second crust. Fold edges of crust over, and flute to seal edges. Make several small slits in the top to allow steam to escape. Place pan on foil or cookie sheet during baking to guard against spillage. Bake in preheated oven for 40 to 50 minutes, or until crust is golden brown and apples are tender. Cool pie in pan for 5 minutes. Place serving plate over pie, and flip to invert, being careful not to come in contact with molten sugar. If some of the nuts stick to the pan, remove them with a knife, and place on pie. Allow to cool for 1 hour. I made this pie for Thanksgiving and everyone loved it.You just need to make sure you don't let it cool for too long before turning it a plate or else it sticks.